White marine paint and new pulls and hinges transform the old cabinets, while new grout and newly sealed tile give a clean, fresh look. This kitchen’s assets ― including well-made cabinets, vintage tile countertops, and a generous layout ― were hidden by layers of aged grout, worn paint, scuffed linoleum, and cutesy detailing. Interior designer Jeffrey Alan Marks eliminated some of the dated look just by removing the wooden window scallop, replacing the knobs with metal handles, and covering the cabinetry with white marine paint. 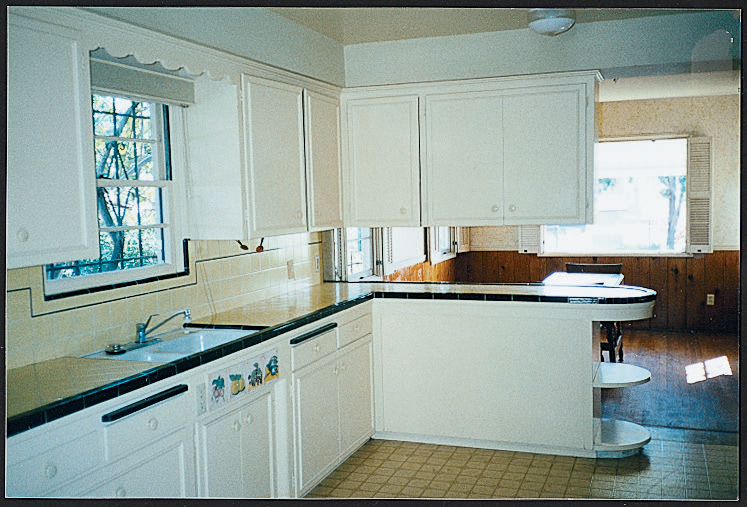 For a lacquerlike finish, he used a paint sprayer to apply paint both to the doors and to the insides of the cabinets. He also replaced the old grout and cleaned, buffed, and sealed the tile to bring out its vibrant yellow hue. A new multipurpose cooking island solved a problem with the old layout: the stove was too far from the sink and blocked the door. After: A new multipurpose island solved a problem with the old layout.